Posted by thelighthousestudio in exhibit, workshop. 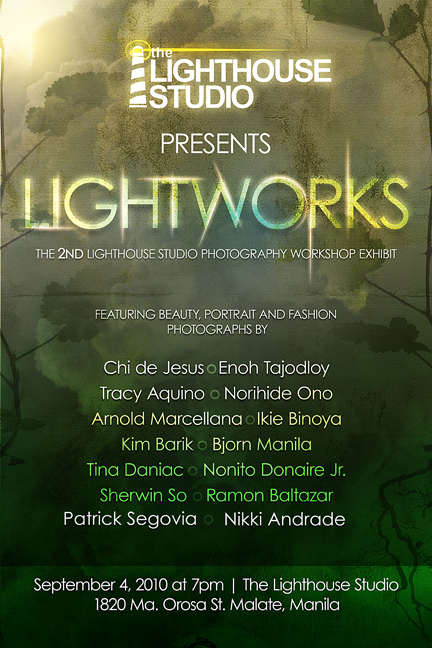 The Lightworks Photo Exhibit is a culminating activity of the Basic Studio Lighting Workshop series. It showcases photographs that my students themselves produced on the 3rd day of their workshop that features fashion, beauty and portraiture. The second Lightworks exhibit will showcase batch 3 and 4’s works that has a unifying theme, “Earth” interpreted in different perspectives, and showing different advocacies that involves our mother Earth. Please see digital invite below! See you all there this September 4 at the Lighthouse Studio!